One More Time Still Cleaning, Now Got To Get To Vacuuming but more and more…. stuff keeps showing up. I know you are going to think I am a horrible housekeeper but really, I’m not. It is just items that Red Wheel sent me and it didn’t interest me, I put it in a pile. Now it is a rather big pile. I ran across a book last night, I know you will love. I have the huge hardback edition of it and I absolutely loved it till I met the author one time. After that meeting, well let’s say I ain’t that crazy about her work anymore. But it is a good book, she did a lot of research into writing it and it has some fantastic spells, tips, potions & a lot more. I should mention since I saw who the author was, I never even thumbed through the pages. It is in super mint, new condition. This book is “The Big Book of Practical Spells, Everyday Magic that Works,” by Judika Illes, author of The Encyclopedia of 5,000 Spells (that is the one I have, it is a huge hard back book). This book is a paperback book. It is a nice size to slip into your purse or if you are a man, easy to store. Here is the description on it……. How about $8.00 on this one? It is an extremely good buy at this price. I wonder if Red Wheel sees me selling all this stuff they will stop sending it to me, hmm…. Judika Illes is an author, teacher, psychic, and aromatherapist. She has a Bachelor of Arts in English and Communications from Rutgers College and earned a Graduate Certificate in Aromatherapy from the American College of Healthcare Sciences (previously known as the Australasian College of Health Sciences) in 1999. She is the author of several books including the bestselling Encyclopedia of 5,000 Spells. Remember this is going for a great cause, to keep me from dusting all this stuff and get rid of it once and for all! Oh and not to mention, Kade getting lumps on his head from the items falling off the bed on him. If you are interested in it, first make sure someone else hasn’t grabbed it up. Then after checking and it is still available, just hit the donate button and send your payment that way. Please be sure to put your address in the comment section so I will know where to send your new book. Thank you for helping me clean up my bedroom. Now can I talk someone into coming over and doing the rest of the cabin, lol! White magic is different from black magic because of its purposes. While the latter induces harm or pain from the other party, white magic is cast for the welfare or the good of the person who will benefit from it. Fortunately, a white witch has more power than a black witch. In this case, we can expect that the good will always win over the bad. For what purpose do White witches use White Magic? For its great deal of power, white magic is used to bring good or protect people from black magic curses or spells. A white witch also uses her power to destroy or break any types of black magic. White magic protects an individual from the harms caused by black magic. There are certain spells and magic that white witches can do00. One of them is the love spell which is the most popular among other spells because we all deserved to feel love and to love. It is the most in-demand forms of white magic as it is to cast love spells on the apple of your eyes. Also, it is used to bring back lost love, to strengthen an existing bond, or to attract a new lover. In addition, it also protects people in a relationship. For instance, couples can get the services of a white witch to protect their marriage and prevent them from getting separated or divorced. Aside from that, there are also specific cases you can be helped by white witches like lost love, soul mate, anti-lying spells, and lust, among others. Aside from relationship spells, there are also things your white witch can do when it comes to money and finances. It is another in-demand branch of white magic that is commonly used- money spells. If you want to become a successful businessman, it is one of the beat spells that you can have because it can take your business and financial status to the next level especially if you follow procedure instructed by your white witch. This type of white magic is one of the most commonly requested by people when it comes to their economic status. This type of spell will drive money to you; thus, adding more fund onto your bank account. If you need some financial gain this year, hire an expert witch to perform this spell for you. Aside from helping you get more money, you will also have the chance to manage your business effectively. Moreover, there is also the healing spell that your white witch can perform for you in order to get you rid off your sickness. It is also one of the most requested types of white spells that you can ask from your expert witch. If you’re loved one is sick, you can also consult this witch to help him recover from his sickness, pain, or injury. This type of healing spell is used to help people who are affected by a certain disorder in their emotional, mental, or physical being. These are three of the most prominent spells that your white witch can perform. To guarantee perfect and desired results, you have to make sure that you also have the pure intention. This document may be distributed freely so long as it is not altered, edited, or changed in any way from its original form. A copy of this document in its true original form may be gotten from our home page. In order to live a full and successful life as a ‘White Witch’, one must first understand what the rules of the game are. The principles which are put forth below are intended to be a very simple, basic way to remember the way of the White Craft. The total idea may be visualized as a four legged stool. Each of the Rules can be seen as a leg and The Law may be seen as the seat. The Rules without The Law are uncomfortable and nigh on to useless in their function. The Law without the Rules gives you a comfortable place to be, but it is rather impractical and again, nearly useless. However, when all of these are brought together they make a highly stable, functional, and enjoyable life. Live – Live each day as if it were your last, for one day you will be right. Love – Love yourself first and foremost. For when you truly love yourself, loving those around you will come as easily as breathing – and we all must breathe. Learn – Learn your life’s lessons – each as it comes – for that is the reason we are here. Enjoy – Enjoy your life, because if you do not most likely someone else will enjoy it for you… and then your time here will have been wasted. The first Rule put forth sounds pretty straight forward at first. Then you actually try to live it! 🙂 Living each day as if it were your last means maximizing your potential for every moment that you have been given. If you are let go from your job… that is an opportunity to face truth and see what you can do to make yourself more marketable and go get a BETTER job. Or, if you are highly motivated, dedicated, and a risk taker you can take that chance to start your own company. When I first began to follow these principles, my business was not very successful, my marriage was only tolerable, and I often felt depressed about my situation as a whole. Then I began to live each moment.’Carpe Diem’ (Seize the day) became my motto. I began to maximize every moment and live in the moment, not for the moment. What is life without love? Honestly, I can’t imagine what that would be like. Yet many people live their lives without the most important form of love there is – the love of the self. If you truly understand yourself and are willing to take responsibility for your own actions you will suddenly find a great love for yourself. In order to give free and unconditional love to another person you must first have that kind of feeling for yourself. This is all this means. One of the cornerstones of The Craft is the belief that our souls are here on this plane of existence at this point in time to learn lessons. Your lessons are different from (although probably quite similar to) my own. Learn what life teaches you. It is no more difficult than this. The life of the witch does not require you to live your life in suffering nor poverty. There are no mandates for pain, unhappiness, or unpleasantness. We do not see suffering as the ‘key’ to getting into Heaven (or the Summerlands as some of us call it). Indeed, we see such things as exactly what they are… unpleasant! This does not mean that we never have unpleasant things happen to us, nor that we walk around in a constant state of denial. We see suffering as either the result of an action we took (i.e. going to jail for robbing a bank) or the way that The Unknown (see “The Deities of Witches” by Torin W.) has chosen to teach us a lesson which we need to learn but have not done anything consciously to bring about the circumstances (i.e. the totally unexpected death of a close friend). I have been asked to explain this statement more than all of the previous ideas combined. I often describe ‘Harm None’ as “the Law which must remain unbroken, but cannot remain whole at all times.” Think about it, you can’t do it as a human being. In order to actually harm none you would have to be in total and complete harmony with all things int he Universe at exactly the same time. Your immune system would not kill bacteria and other infections (because that would be harming them). Nor would you allow the bacteria to infect you because that would cause harm to yourself. You would not eat meat, nor vegetables because it would cause the destruction of either. Neither would you not eat because that would harm you. Do you see how this is simply an impossibility? What I teach my students is to take great pains to Harm None and to think out the results of any act as far as possible ahead of time. I also stress that whenever magics are being worked that the free will of any individual or group should never be infringed. I have been asked specifically about the use of various types of drugs in witchcraft and their relationship to the ‘Harm None’ principle. I believe that The Bright Ones gave us a sober state of mind for a reason. They also gave our brains some of the most potent chemicals known to man for achieving altered states of consciousness. Therefore i see no reason to alter the chemistry of the brain in order to ‘gain enlightenment’. Ask any recovering drug addict… he/she will tell you that the drugs lie to you. Because of part of the training I give, I require that no illegal drugs are used while under my tutelage. In fact, if a student becomes sick during training and requires a prescription strength pain reliever, the training schedule is reworked to allow for the purging of the body before training resumes. In short, I personally feel that drugs can be a great hinderance and only cause damage to your soul. But I also recognize the free will of the individual. I can only tell you that in my own perception, drugs do cause harm to you. Following our guide to white magic, we’ve written another outlining the habits which every white witch should cultivate. ‘White witchcraft’ is a term traditionally used to describe magic which is performed for good and unselfish purposes – people of any colour can be white witches, and even though we use the term “she” in this article, men can be white witches too! 1 – A White Witch Respects Nature Nature is an important source of inspiration and wisdom for witches, and most Wiccans recognise that the Divine is present all around them in nature. This is why everything that exists in nature – from plants to animals, to rocks and elements – is regarded as sacred and treated with respect. But what does this mean for a modern White Witch who’s trying to find her way through the jungle of big city life? It means developing habits that protect the environment, such as recycling, buying fairtrade and eco-friendly produce, choosing to eat organic food that’s free from pesticides, and other activities that help to renew and restore nature. 2 – A White Witch Casts White Magic Spells The Wiccan Rede states “An it harm none, do what ye will.” The White Witch is aware of this when preparing her potions or casting magick spells. She makes it her best practice to observe this law. She sees her magic as a way to serve good and selfless purposes. For this, she knows that she needs to do some inner searching to find out what her true motivations are, so she can ensure that her magic truly is designed for selfless purposes. She recognises that Black Magic aims to take energy away, that it’s designed to manipulate and hurt others. So before casting love spells, money spells or healing spells, she takes the time to ensure that no one will be manipulated or cheated by her spells. Even if someone has wronged her, she tries to forgive them, seeing the act as a limitation of that individual’s perspective or an unresolved and deeply seated hurt that they are not aware of. She does not engage in revenge spells because she knows that all people are born of the Divine and therefore all are One. She knows that by hurting someone else, she’s actually hurting herself. Before casting a White Magic Spell, she asks the spell to serve the highest good for everyone involved. 3 – A White Witch Knows the Value of Silence We live in a culture that prides extraverted attributes – people who can perform public speaking, loudly state their ideas during work meetings and entertain others with casual chit-chat are regarded as successful. But silence has its own merit, and a White Witch knows the value of silence. She does not feel guilty for giving up on social activities whenever she feels the need to retreat into the silence of her own room to meditate and do some inner searching. A White Witch might have a daily meditation practice (10 minutes will do) that allows her to tap into her inner wisdom and intuition, and use it for guidance in her daily life. 4 – A White Witch Clears Her Energy A White Witch knows that energies accumulate. Everything around her vibrates with a certain emotional or energetic signature and she picks up on these vibes like a radar, especially if she’s a particularly empathetic or sensitive individual. In order to clear herself of the residue of everyday life, she uses white sage, daily rituals or meditation to cleanse herself of the imprints that have been left on her energy field. She knows that having boundaries is healthy (unless they start to feel isolating) and she’s careful not to sacrifice the ‘me-time’ for anyone else, a time that she needs for herself. 5 – A White Witch Recognises the Divine All Around Her Just as nature is to be honoured and respected, so is everything else. The Divine is present all around us, and it’s both male and female. Therefore the goddess is just as important in Wicca as the god is. A White Witch recognises that the Divine is present in all of us, too. And so, any spiritual practice dedicated to a god or goddess is not complete, unless it is extended to the daily dealings with the people around us. What’s more, a White Witch knows that the magical powers that she develops are not unique to her – everyone is entitled to them, just as she is. 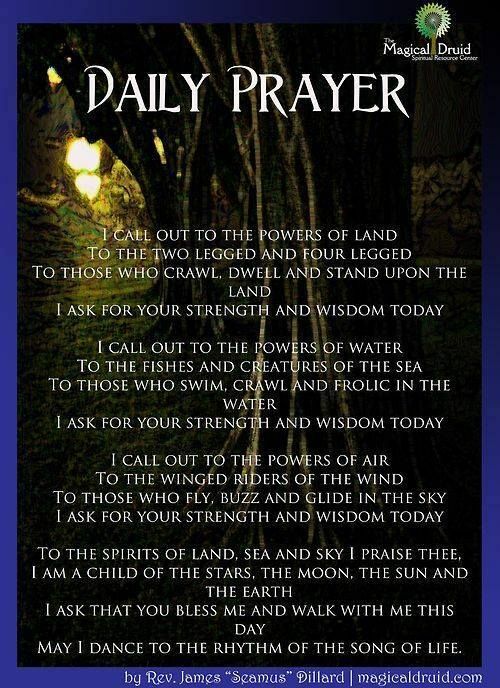 Everyone can tap into magick and their inner wisdom, if they make an active choice to do so. 6 – A White Witch Acknowledges Personal Responsibility “Ever mind the rule of three: What ye send out comes back to thee.” That’s how the Rule of Three or The Law of Threefold Return goes. There are many interpretations of this law. Some believe that it is similar to karmic laws – if you do harm unto others, if you send negativity out into the Universe, then negativity will come back to haunt you threefold. And the same goes for good things – if you do good deeds, then good deeds will come back to you threefold. Of course, in life it does not always feel like that, so it’s very important to recognise not only your actions, but also your intentions behind your actions, and things start to make more sense. For example, helping someone is generally a good thing, but if you help someone without them asking for your help first, the energy that you send out into the Universe is not helpful – it’s actually binding and controlling, and that’s the energy that you’ll receive back. Although the Law of Threefold Return is interpreted in many ways, what’s important for a White Witch is to recognise that her actions will have repercussions, and they are likely to be physical, emotional and spiritual. So before you engage in an important action, examine your intentions first, and be aware of the potential consequences that your actions may have. When you do, be ready to own up to those consequences. 7 – A White Witch Respects the Beliefs of Others Although a White Witch has found her own Path, she is fully aware that this Path is unique to her alone. Therefore, she does not object when others share their personal spiritual beliefs. She doesn’t mind that other people may not share her beliefs – she knows that they come from different backgrounds, family settings, even cultures. She is simply grateful to have found her Path and shares her insights with those who ask her about them. She does not preach or try to convert anyone to her version of the truth – rather, she delights in learning about the different perspectives that others around her hold. 8 – A White Witch Knows That She’s Just Human While a White Witch is aware of the Threefold Law and that Divinity exists all around her, she knows that she is merely human. Humans are flawed by nature (if you believe that perfection even exists) and so she knows that she can’t possibly predict all of the consequences of her actions, that she has all kinds of feelings (sometimes negative) and that sometimes she needs to vent these to someone, or ask for help. She sees no shame in this because a White Witch does not strive to be perfect – she tries to be kind to herself and not to judge herself too harshly for her mistakes. When she practices self-love, she feels that she becomes kinder and more forgiving to those around her as well. Do you have dreams that come true? Are your dreams often apocalyptic or do you meet loved ones who have passed? You may also dream of shapes – in particular a five pointed star or a triangle. These shapes can appear in nature throughout our dreams such as five petals on a flower, or a triangle-shaped leaf. A circle is also a symbol of witchcraft for it means the wholeness of the world and eternity. A circle is also symbolic of the moon and witches are often referred to as children of the moon because of the goddess Diana. Do you walk into a room of people and know immediately if there has been an argument? Can you sense if a room full of people are friends or foes? Further, can you feel if something is just not right? Many witches are highly clairsentient which means all feeling, all sensing. Witches are all feeling for we are earth and human. Therefore, we feel all the emotions that humans have. Do you want to be outdoors, whatever the weather? You might also like to be outdoors at different times of the day and night. In fact you might even feel you come alive at night. You will love the smell of grass after it has been cut or the smell of summer rain. You might even be able to smell the snow coming in winter, as witches are the children of nature. Can you feel another’s pain or discomfort? People may talk to you and want your advice or want to confide in you about their problems. People feel at ease with you because of your caring and sensitive nature. In the past many witches, especially white witches, acted as local counsellors. People sought our help for all manner of problems and concerns. Think back into your childhood, has there been an animal, bird or insect that is always with you or found you wherever you have been even on holiday? It could be anything from a spider to a cat or a crow. It could even that stray dogs seem to follow you. These animals seek you for they are what we call familiars, an animal, a bird, or an insect which is your companion. These familiars are your gifts from spirit to guard you and look after you. Do you like spending time creating homemade herbal cures and remedies? Are you fascinated by homeopathy? Maybe you use lavender to help you sleep or peppermint tea to calm and cool your stomach. Witches were renowned healers and apothecaries. We were midwives and carers long before there were doctors. Do you find that children and animals just prefer to be around you instead of their own parents and others? The reason children and animals are attracted to you is they can sense the magic and wonder in you. You also make them feel safe and they know they can trust you. You might like watching documentaries about the Universe and all the different planets. You might intrinsically know that there is more life out there in space but you also know that we are all connected. That all the paths and movements of the planets affect us here on planet earth. You might be interested in the zodiac and astrology. You like making things from candles to cookery to dressmaking. You love to create and feel at home either in the kitchen brewing up a recipe or making presents or cards for people. You care deeply for the earth and environment and try to protect the Earth whenever you can. You adore the seasons and the changes in nature they bring. You recycled long before everyone else did. You love the autumn, the winter frosts, the spring flowers and the bees buzzing in the summer parks. You do everything with goodness in your heart. You try your best at everything. You also believe in magic and all that it means including the possibility of fairies and other elementals of the earth. You may also believe in ghosts. Yet in all your beliefs and in all what you do you feel strongly there is a force of good and you are a part of it. chances are you are a witch and a white one at that. And the one thing to remember with witchcraft is that once born a witch always a witch. You have been here before and now witchcraft is finding you again, so embrace it. Witchcraft is not meant to be difficult or challenging; it can mould its way into your life with such simplicity that you will realise it was already a part of you. Tudorbeth is a hereditary practioner of the Craft. She comes from several generations of practioners of Witchcraft and learnt the practical side of magic from her father and the esoteric side from her mother. The rules and gifts of herb lore, scrying, healing, tasseomancy, numerology and candle magic all feature in her books. Tudorbeth has written many books on witchcraft including the series Magic in the City. There is one golden rule when it comes to Mercury Retrograde phases. Interestingly enough, it’s grammatical. If you can commit this simple tenet to memory then you’ll find that retrograde cycles of Mercury are not only easier to navigate, but also rich with potential for growth and personal development. Ready class? Here’s the rule. Remember back in grade school when you learned about the prefix “re?” Well, a prefix is placed before the root of a word and this one means “again.” All you need to remember is that during any Mercury Retrograde cycle, if you’re doing something that begins with “re” such as reassess, revise, revisit, reconnect, redo, recall, resay, refresh, you’re right on track. If you’re not then stop immediately or else suffer the Mercury Retrograde migraine! 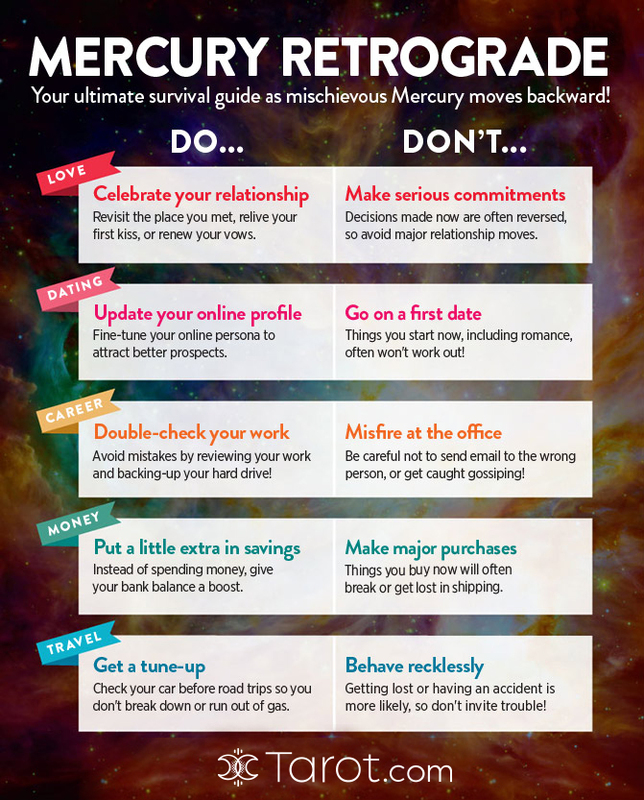 Here’s a top list of dos and don’ts that will help you navigate the confusion around any Mercury Retrograde phase, and don’t forget to save and share the graphic below for a reminder all Mercury Retrograde! DON’T initiate. DO finish what you’ve started. No matter how fantastic your new plan may be, hold off on the launch while Mercury is trekking backwards. There’s a high probability that you’re missing crucial information or that whatever you pitch to others isn’t going to sound as phenomenal to them as it does to you. Instead, use Mercury’s Retrograde as a time to take stock of whatever you’ve already got going on and do your best to polish up and finish existing projects. This certainly holds true for writing projects (and Mercury Retrograde is a perfect time to edit and revise work). However, it also applies to all areas of your life, from work, money and relationships. Usually, it’s best to not start a new job, get married or begin a new financial chapter in your life now. Polish up your resume, plan your wedding or research investments instead. DON’T purchase big ticket items. DO comparison shop. You should not purchase any big ticket item such as a car, computer, appliance or even a piece of jewelry during Mercury’s retrograde for several reasons. First, if it has moving or electronic parts, there’s a good chance that you’ll find a glitch. Repairs are fine (and a perfect prefix) on existing equipment … however no one should have to repair a brand new item! In addition, during Mercury retrograde you might not receive the best bargain if you rush to purchase. If you can wait for your item, it’ll be wiser to shop after Mercury is direct. In the meantime, comparison shop and spend more time thinking about what you really want. You might find that you’ve changed your mind completely by the time Mercury turns direct! DON’T sign contracts, make verbal agreements or life altering decisions. DO renegotiate, mediate and reconsider existing ones. This might be the most widely known tip about Mercury Retrograde, but it bears clarification. If at all possible, avoid new agreements! Because once you sign the dotted line or give that handshake, you will likely find that a series of events or misunderstandings cause the initial pact to change or fall apart. Instead, this is a good time to consider a renegotiation. Is your lease up for renewal on your apartment? Now is the time to either shop around or do research on a better agreement to propose to your landlord once Mercury turns direct. Are you considering asking for a raise? Use this cycle to recognize what you are worth but also to reevaluate whether or not you’re offering your best to the company you work for. If you’re not, now is the time to implement revisions. Are you ready to break up with your lover? Even if your mind is made up, you’ll want to wait. A life altering decision implemented under Mercury retrograde has a waffling effect. You might go through a “make up and break up” phase that is exhausting. If you want a clean break and you’re sure, wait until Mercury is direct. There will be no confusion or second guessing! DON’T hide under a rock and stop living. DO expect delays and snafus. Preparation and patience are key during Mercury Retrograde cycles. If, for example, you have a trip planned and you notice it’s during a Mercury Retrograde, don’t cancel your plans and stop living! Instead, consider the added potential for mishaps and prepare accordingly. Recheck your baggage to ensure you’ve packed everything vital. Make sure you have all the proper documentation for your trip. Anticipate delays due to the added issue of miscommunication. Roll with it! In short, Mercury Retrograde cycles are not meant to be the source of endless aggravation. However, if you go against the flow of this cycle you’re likely to experience more stress. Taking pause every now and then allows us to gain a new perspective and realize what we might have missed in the past. Now we get a chance to fix it and become even stronger because of it … thank you Mercury Retrograde! On November 16, 2018 planet Mercury goes retrograde for the last time this year, pushing us to look at the fine print and reflect on what we’ve done. With Mercury beginning its retrograde in truth-seeking Sagittarius , a place that’s not exactly comfortable for Mercury because of the Sagittarian nature to skip over important details, we’ll need to be extra careful in paying attention to the facts. Mercury Retrograde in Sagittarius will also be teaching us the value of thinking before we speak, while showing us the ways we need to honor and tell the truth. By December 1, Mercury dips back into secretive and intuitive Scorpio where it will stay retrograde until December 6. Through Mercury’s dive back down into the underworld, our lessons will involve going back and uncovering information that we may have been previously unaware of — or have tried to avoid — and bringing it to light. You probably haven’t been feeling as adventurous as of late, but this retrograde is here to help rekindle your spark. If you’ve put some travel plans on the backburner, or if you’ve been thinking about revisiting a place that you love, go. Just make sure you leave room for a few travel hiccups. Thinking about going back to school? This is also a good time for that. And if you’ve been working on a book project, retrogrades are great for revisions. In terms of an intimate relationship, you could get the chance to go back and say the things you didn’t before. You may need to do a double take where your finances are concerned as this retrograde could cause some confusion around your bills and expenses. If you’ve been paying more than your fair share of a bill or more than you can afford, this retrograde period could help you to renegotiate the terms of your payment. On a separate note, this Mercury Retrograde could bring some things up for discussion between you and an intimate partner, especially if those things have been things you’ve been trying to avoid. Talking about these uncomfortable matters will help you to clear the air and move forward. Relationships are the focus now, which means you’ll have to make sure you’re crystal clear when it comes to communicating with others. This may mean going the extra mile to ensure you and everyone else are on the same page when making plans, communicating via text or email, or doing something as simple as holding a conversation. If there’s an agreement or contract on the table, try to give yourself as much time as possible to read the fine print and think things through before saying “yes.” In terms of your schedule, the less on your plate, the better. One day at a time. That’s the message for you now as plans and events could quickly go awry if you try to take on too much or move too quickly without paying attention to the details. You can keep things under control at the office by consistently communicating with your coworkers and backing up documents, emails, files, etc. Your health is in the spotlight too as this is also a good time for scheduling a check-up. In love, an ex could return. However, this could also be a good time to review what you can improve in your love life. With Mercury backing up in your zone of communication, you can expect all the Mercury Retrograde rules to apply to you over the next few weeks. Some of the rules are: Back up your important files. Proofread emails, documents, messages, etc. Watch what you post on social media. Give yourself some extra travel time but make room for delays and last-minute cancellations. And before you sign on or agree to anything, make sure you know all the details. When it comes to money, remember how much you’re worth. Some renegotiation may be necessary around a financial contract. It’s time for you to take a closer look at your cash. Does everything look legit? Do you need to follow up with the people who may owe you money? You’re going to have to be on top of the dollars going in and out of your bank account, so you can avoid a major headache down the line. And when it comes to making a big-ticket purchase, researching the product you’re buying before you buy can help avoid having to return or repair it later. Meanwhile, now’s your chance to speak up and clear the air. You’re a tell-it-like-it-is kind of person, but under this retrograde you might want to take a few moments to think things through before you speak. Otherwise, your message may not be received the way you intend. At the same time, when it comes to your thoughts and words, it’s time to review the way you use them. Could you stand to be more gentle or compassionate with what you say to yourself or others? On a similar note, there will be times when certain things may be better left unsaid. Don’t let discretion become an issue. Listening pays off. You’re thinking might be a bit foggy for the next couple of weeks as Mercury spins backwards in your zone of rest and retreat. That means you may want to hold off on making any major decisions or overanalyzing a situation. The answers will come when you’re not so close to the subject. Instead, clear your mind and find your Zen. Creative or solo projects could be the perfect outlet for you now. On a separate note, reconnecting with old friends can feed your soul. Don’t be afraid to reach out to them if you need a little comfort and company. You may have to go the extra mile under this retrograde to make sure you’re on the same page with everyone else when it comes to event planning or anything that involves working with folks on a team. In terms of your circle of friends, a miscommunication could push you to address an issue that’s been festering for some time. Welcome the dialogue. Meanwhile, keep in mind that your dreams are worth pursuing, even if you have to make some adjustments. When it comes to work-related deadlines, presentations, or events, don’t leave anything up to chance. Be prepared. Your career comes into the spotlight during this Mercury Retrograde. With all the attention on you now, know it will be super important for you to dot your i’s and cross your t’s when it comes to information you need to share with the public or your higher-ups. On a different note, this retrograde could have you rethinking your career trajectory, pushing you to come up with a viable plan of action in getting yourself to the top. This plan could include returning to school or getting additional training in your field of choice. Lastly, don’t be afraid to challenge old beliefs. Just be yourself Aries, for there really is no one better. You have been making recent changes based on what you think other people want you to do rather than what is actually best for you. Time to change this for you to get the most from all others want to offer. Ring now for answers. Secrets come to light and what you learn that you did not know before, is how good you have been at standing by those who really don’t deserve it. Being open to new ideas socially is what can help you gravitate towards more suitable friends. Call now to hear who your soul mate is. Try not to allow well-meaning but naïve friends to give you bad advice. Remember you are a sign of individual needs who needs to stand up for what they truly believe in and not give in to those who are only thinking of their own needs. Ring now to hear how cancelled plans are a blessing. Venus is making it hard for you to see the difference between fact and fiction. You begin to realise that certain signs are out for what they can get, rather than trying to help and support those around them. Phone calls you make today can arrange a better working week. Ring now to hear which enemy is really your ally. Don’t spend too much time thinking, just do. Thoughts you have about your professional future may seem far-fetched but are actually exactly what the stars have planned for you. Grab what is ahead with both hands. This really is your time my friend. Ring now for promotions to knock at your door. I know you feel as if you could do with some more time with a loved one, but they have already taken enough time out from all they had to do than they wanted to, so give them a break. Fun times this week rely on you turning up on time and not late. Ring now to find the patience you’ve been lacking. I know it feels as if it has been all work and no play but that’s because you’ve worked so hard and you’ve done better than you thought. Travel plans you make for Christmas are a good reward for what is now a very successful path to your destiny you’re on. Call for answers. Try not to let others bring out your jealous side Scorpio. You and I know you are better than that and I also know that the people who are trying to get a rise out of you are not even as strong as you! Ring to hear how forms you sign now ensure a better financial future. A busy feel to your chart should see you achieving more this week than you have all year. Try not to join in with any negativity that others choose to indulge in or you will only end up looking like the ringleader and you and I know you are better than that. Ring now for a full reading. Instead of focusing on all that may go wrong in a relationship, try instead to focus only on what can and should go right. By putting your best efforts into all that is in front of you then you can build up the support team which will take you to your best chapter yet. Phone so I can put a smile on your face. Financial affairs prove hard to understand and you may find yourself having to pay for those who never have and never would do the same in return. Being fair in family affairs tonight is what can get you back in the good books of a loved one. Ring now for love to prevail. When it comes to friendships and love, quality is much more important than quantity. The people in your life will be yours for life. If you were born on November 17, you are the bridge that brings everybody together! Logic, understanding, and genuine kindness are at the forefront of your mind and drive your desire for everyone to get along. If you have a chaotic family, a splintered group of friends, or a combative set of colleagues, you will strive to uncover a way for those around you to come together. This will make you a great leader! You’ll bring unique people from different backgrounds and create a solid foundation of camaraderie for those you inspire! Just make to take care of yourself and your happiness first.